I eat a lot of kim chee. I usually have a jar in the fridge, and I find it makes a nice snack. Plus, it’s a Super Food — packed with antioxidants and other unquantifiable health-improving properties. During the avian flu outbreak in Asia, it’s said that Korea derived a good deal of protection from eating kim chee. My wife, on the other hand, is not so fond of it. “What is that awful smell?” she says whenever she comes into the kitchen after I’ve snacked. When I stumbled on a kim chee article in an old issue my favorite cooking magazine, I took that as a sign it was time to try making it on my own. I drove to a Korean supermarket in the not-so-appealing depths of the San Fernando Valley. The entire store, it seemed, was focused on the kim chee needs of the Korean American public. There was an entire aisle devoted to red pepper, and a mountain of napa cabbage in the produce section. I rarely visit Korean markets, so I felt less confident than I typically do in ethnic markets. But after an hour of circling, timid queries and the periodic eureka! moment, I headed to the check stand with three large heads of cabbage, an impressive daikon, dried shrimp, a big bag of red pepper and other odds and ends. The preparation was epic. A full Thursday morning and much of the afternoon vanished in a Ulyssean effort of washing, chopping, salting, de-salting, julienning, mixing and massaging. But in the end, my big jar of prepared cabbage looked impressively, beautifully like kim chee. I even had enough left over for a second, smaller jar. I was going to be eating a lot of kim chee. The first morning after the first day of my ferment, I entered the kitchen to discover that my kim chee was trying to escape. The sealed jar had sprung open at the top, and the entire counter was covered with reddish liquid. 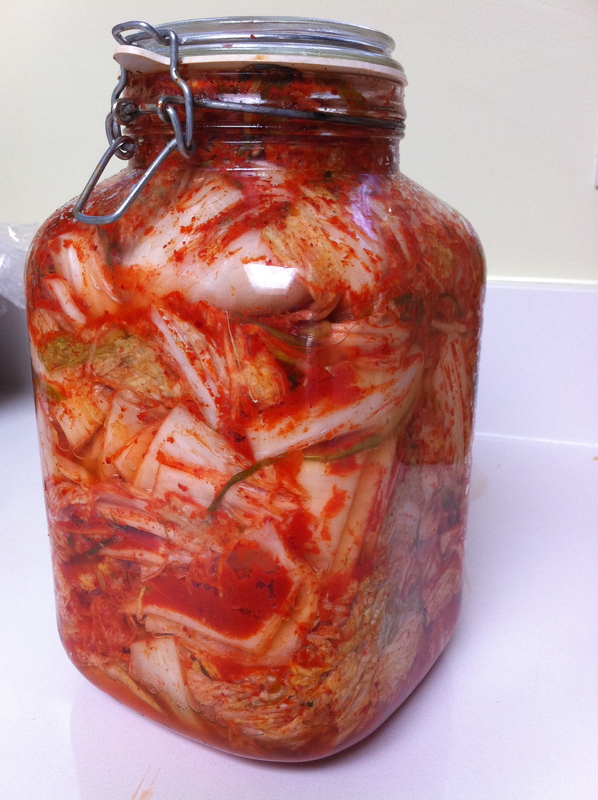 I scooped the top couple inches of kim chee from the jar, re-sealed it, and cleaned up the mess. A short while later I found my 7-year-old son staring into the jar as if it was an aquarium. “How come it’s moving?” he asked. I tried to explain to him how in the kim chee fermenting process, your food actually moving was a good thing. The expression on his face told me that he thought otherwise. I gave the smaller jar to a friend of ours who also likes kim chee. I figured she’d try it first, and if she survived, I’d know it was okay to eat from my own giant jar. I was at the elementary school the other day, when I saw the mom of the Korean kid in my son’s class. Here’s my chance to impress, I thought. I announced the details of my adventure, and she glared at me. “Have you ever made it before?” she said with a prosecutorial tone, as if my . She also shared a few tips for things to do with kim chee other than snacking on it, including combining overly fermented product with fatty pork in a soup that must be the ultimate hangover cure, or forming it into pancakes with egg a pork. That’s a good one, and here’s a recipe for those of you who, like me, think kim chee is pretty darned good and may have a jar tucked in a back shelf of your fridge. If you don’t have rice flour you can use one cup regular flour. Mix all the ingredients except oil, salt and pepper together in a large bowl. Heat a couple tablespoons of grapeseed or other oil (canola) in a large pan over medium-high heat. Spoon the kim chee jeon mixture in as you would making regular pancakes, and cook a few minutes on each side until crisp. Repeat, adding more oil as necessary, until all pancakes are made. Serve warm, sprinkled with flaky sea salt and freshly ground pepper. Goes really well with a cold Japanese beer. I LOVE KIM CHEE…always have but PORK!!!!! OMG….. I really can just imagine Flynn’s face…and Leslie’s…like WTF is he growing/cooking/formulating NOW???? Yes, always have a jar. Love it with sautéed shiitakes and brown rice. You should try making it, Ben. Yay for whatsaysyou, too! Thanks for visiting!! I had a similar experience when making it which put me off it for a while. I need to get back on the horse. That Korean market was my favorite hang-out when I lived in the valley. I let Chris explain it in more detail, but as a young man, he made some and it blew up on him. Not that we don’t love it…..